Oilfield Rental Companies usually provide additional or separate field services using different equipment. RigER helps to track crew and equipment oilfield operations and make performance analysis. rig up, rig down, tune, setup, delivery, test, inspection, safety, water, electrical, welder, recertification, etc. Field technicians do these field jobs in small companies. Big companies build crews. We added oilfield crews to Delivery Tickets at RigER version 2.6. Crew lead can enter individual service hours (billable and actual) for every job. Total hours numbers for each crew member are presented in Crew Report. Service equipment hours tracked by equipment serial numbers. Billable and actual hours for every job entered to Delivery Ticket. Service Equipment Hours Report shows numbers for each equipment serial number. Rental Receipt tracks short-term rentals: hourly, 4-hours, 3-days and so on. Rental Receipt is a 3-in-1 combination of Rental Agreement, Delivery Ticket and Rental Invoice. This document allows fast entering rentals and service. To activate new modules in version 2.6 simple click to the proper box in Global Settings. Another big update is Revenue Analysis and KPI Reports. This feature required some changes in RigER configurations: rental receipts and rental job invoicing. by client, location, rental agreement, type (rental, service & parts), unit and serial number. Contact info can be included to the report. We build new complex reports to analyse all aspects of oilfield revenue: Rental Units, Services, Goods, Materials, Clients, Locations, Engineers, Area, Field Technicians and Trucks. Revenue TOP-10 provide ABC revenue analysis of Rental Units, Services, Goods, Materials, Clients, Locations, Engineers, Area, Field Technicians and Trucks. See the article about KPI for Oilfield Rentals. 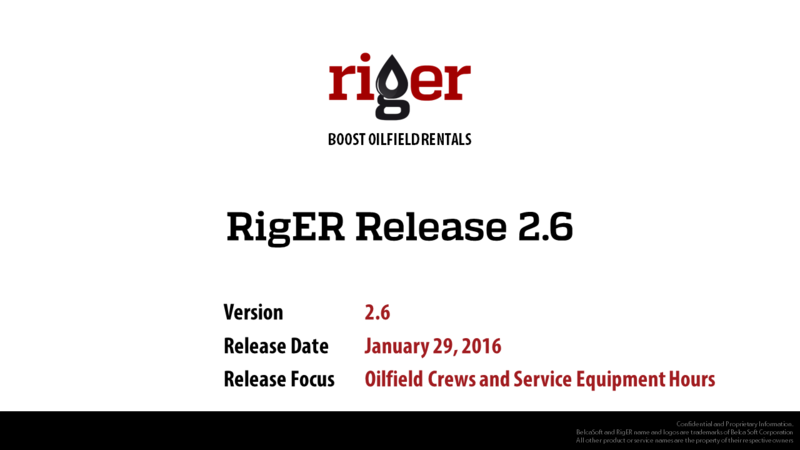 RigER version 2.6 is our next step to boost oilfield rentals. RigER is leading oilfield rental software and we keep improve our product. new features, product customization and oilfield rentals. All current users will receive free update to RigER version 2.6 on February 7, 2016.